First published in 1996, CCJ is a bilingual (Chinese/English) technical / trade journal offering an integrated print and digital platform to the global coatings industry. CCJ brings readers market news and trends, technological advancements, new products and services, to expand their knowledge and keep up with latest industry development. CCJ is published 5 times a year in March, May, July, September and November, with a print circulation of 9,000/issue and a digital distribution of 12,000/issue. As the official publication for the reputable CHINACOAT series of exhibition, an additional 12,000 copies of ‘CHINACOAT Directory’ is published and distributed at CHINACOAT exhibition. Global coatings market is forecasted to witness significant growth owing to increasing demand in housing and infrastructure projects, rising disposable incomes and urbanization, and thriving middle class in the emerging economies. CCJ provides advertisers with a shortcut to connect with potential customers of the industry. CCJ is the official publication for the CHINACOAT series of exhibition and thus enjoys the exclusive channel of an additional 12,000 copies of ‘CHINACOAT Directory’ being published and distributed to the show visitors. Exhibitors can rely on this special opportunity to capture attendees' attention and maximize onsite exposure while non-exhibitorscan convey your messages to locate more sales leads. Our editorial team and contributing writers are industry experts and consultants to ensure a careful and proper editorial planning in each issue. Our feature articles cover new technologies and innovations, market trends, new product releases, renowned supplier profiles, interviews of prominent enterprises and specialists, and much more. 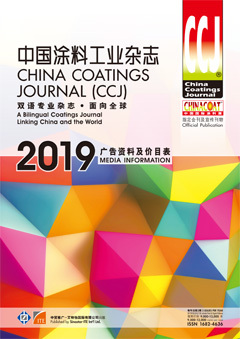 CCJ is the ONLY bilingual publication being actively published for the coatings industry in China, Asia Pacific region as well as the rest of the world. Your advertisements will reach industry professionals and decision-makers of the industry directly. China Coatings Journal (CCJ) is published by Sinostar-ITE Int’l Ltd., with its registered office at Room 2101-2, 21/F., Jubilee Centre, 42-46 Gloucester Road, Wanchai, Hong Kong. CCJ is published in five issues a year, in March, May, July, September and November.